Here's a full printable THM menu! I hope this saves a lot of time for you this month. 🙂 I've cut back on dairy and noticed some great results, so this menu has very little dairy and can be made dairy-free pretty easily. Since I'm traveling, the printables for this month are pretty plain, but they still work! P.S. – Please read the notes below before you start the menu, and remember – you can sign up at the bottom of this post to get tons of free THM menus, straight to your inbox! P.P.S. If you haven't yet, please check out Resources Page that shows you where I get ingredients and some of my favorite stuff, so you might want to check it out! I have a page included in the download with staples that I have to buy online. You'll need that stuff for protein shakes, but if you're a Trim Healthy Mama, you probably already have lots of it! If there's no clickable recipe link, that means it's super simple and you can make it to your liking. If, for example, you don't know how long to cook chicken thighs, you can just season them to your liking and cook them the way you normally do, or search for instructions online. As always, please note that my menu planning system includes repeating breakfasts, lunches, and snacks throughout the month for simplicity. That means there are 7 breakfasts, 7 lunches, and a handful of snacks included on this menu. My kids and I enjoy the routine of knowing that on Monday we will be eating a certain thing for breakfast and a certain thing for lunch – it definitely saves time in the kitchen! Some of the dinners filled us up, but it just might be us – feel free to add a side salad or round out your meals as desired. Remember that THM is SO ADAPTABLE! 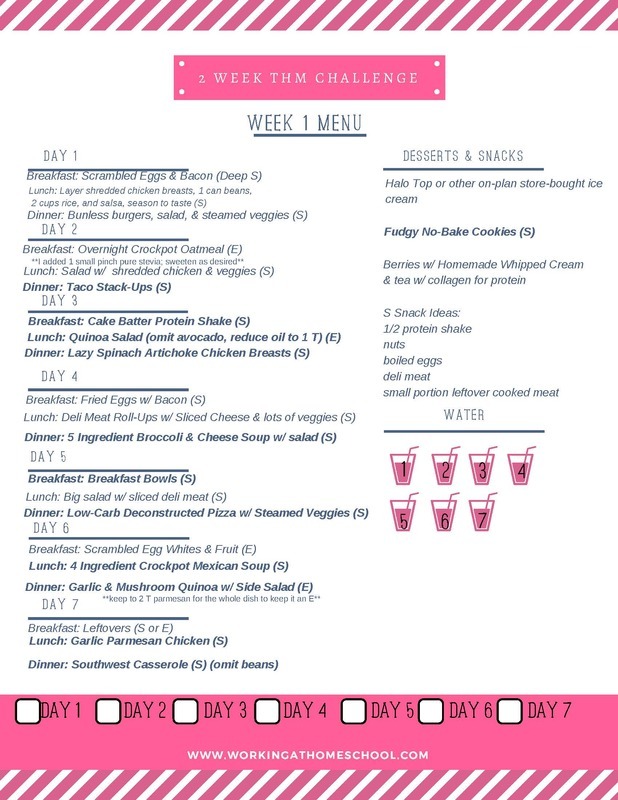 There are more E meals this month because I needed to save money and my body has been responding well to E meals, but you may need to swap out E for S, or switch things up during the week. Don’t be afraid to mix up your fuel types and keep your body guessing! This menu and the shopping lists that go with it feed my family of 7, but my oldest is 13. If you have bigger kids, or big eaters, you may want to add more protein, rice, and veggies to your shopping list. It doesn’t hurt the recipes to add an extra chicken breast or 1/2 lb of ground beef to make a meal stretch, and you can always add extra rice or veggies or salads as side dishes for the kids. When money’s tight, I’ll grab a bag of potatoes and give the kids a baked potato lunch when I’m eating a salad, or serve them as dinner sides that I avoid. If you have a smaller family you may want to make the meals as directed but freeze half (if it’s freezable), or just eat the leftovers for lunch. Here’s my experience with THM https://thewellplannedkitchen.com/2014/06/19/i-lost-10-pounds-and-kept-them-off . I also have a top ten tips article https://thewellplannedkitchen.com/2014/12/06/top-trim-healthy-mama-tip , and there’s tons of info on the Trim Healthy Mama website! I cant get any if your links to the recipes to work. I have tried on three different computers. What am I missing? Hi Tamera! If you click the printable pack marked “March 1-7”, or whichever week you’re looking for, you’ll get the printable shopping list and clickable recipe links. Thank you for sharing your menus! Pretty close! 🙂 I hope it works out for you! How do you find anything on this site??? I’m looking for the video on the wonder wraps. I’m really sorry, I don’t have any videos here. I think you might be looking for trimhealthymama.com. I’m working on it now and hope to have it up this evening! I was so proud of myself for having it almost ready to go last night, and then I woke up this morning at 3am with food poisoning and I’m just finishing it up now. It’s always something!